Projects from 40 to 65"
The Epson V12H516020 Ultra-Short Throw Table Mount for BL Series Projectors is specifically designed for mounting BrightLink 475Wi, 480i, and 485Wi projectors on to tables. 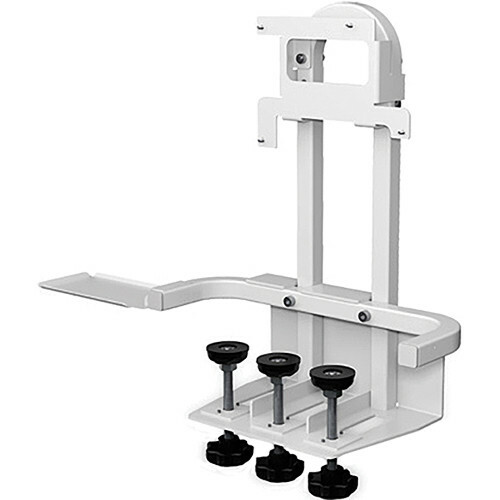 The hand-adjustable clamp design easily attaches to 0.6 to 3.1” (15.2 to 78.7mm) thick tables. Also, it allows you to adjust the projector position to create large size (40 to 65" (diagonal)) images without causing any damage to the table surface. Distance between the edge of the table and the center of the bolt is 1.4 to 4.5" (35 to 115 mm). Box Dimensions (LxWxH) 24.1 x 17.5 x 9.5"
V12H516020 Ultra-Short Throw Table Mount for BL Series Projectors is rated 5.0 out of 5 by 1. Rated 5 out of 5 by Derrick from Right Tool for the Job! This table mount is used for my Epson short throw, interactive projector. It is well built in fact a little on the heavy side which for me is good because I'm trusting that it will safely and securely hold my projector. I don't want to worry about the mount and the projector tumbling to the floor so this is the right tool for the job!